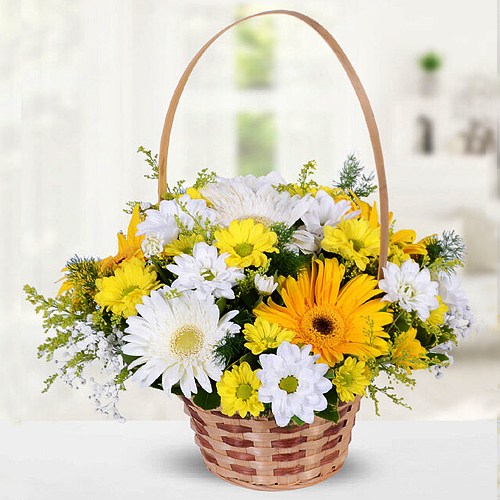 Send our White & Yellow Flower Arrangement and express your earnest compassion with grace, beauty and poise. This Gift will rightly convey your feelings to your loved ones at the time of their loss and bereavement. Flowers Delivery Thirualla, Send sweets Jammu, Wedding Cake Pollachi, Diwali Mithai Jalna, Send Flowers and Gifts to Gulbarga, Online Shop Mathura, Flower to Jaipur, New Year Flowers Patna , Fresh Fruits Tellicherri, Send Gift Srikalhasti, Dry Fruits to Silvassa, Birthday Delivery Moradabad, Sending to Valsad, Flower shop Srikalhasti, Zirakpur Online Cake Delivery.